What If We Just Dance Until We’re 69? When I was a teenager in the ’80s, I could seriously rock a black velvet babydoll and faux leather tights. When the parent organization at my children’s school hosted an ‘80s-themed “Parent Prom,” I discovered that in my advancing middle years, given the dress, the tights, and some black Chuck Taylors, I can still rock it. It just hurts really, really bad the morning after. Imagine the ‘80s prom you never got to go to. Yeah–it looks like a John Hughes movie: the gym transformed by colored lights, a mirrored ball, a video music screen. The Michael Jackson wannabe heading up the prom committee can actually moonwalk, a little. A Siouxsie Sioux fangirl compliments his outfit. The gaunt-faced DJ, looking like a cross between Adam Ant and Keith Richards, plays so many great songs in a row that you begin to wonder whether he reads minds. The preppy kid dressed in doubled pastel polo shirts with the collars flipped up appears to be necking with a member of the Runaways. Don Johnson shows up with one of the Robert Palmer red-lipstick band girls. And they’re necking, too. But we’re not in a Hughes movie. This is our kids’ gym, and these are not our usual party clothes. 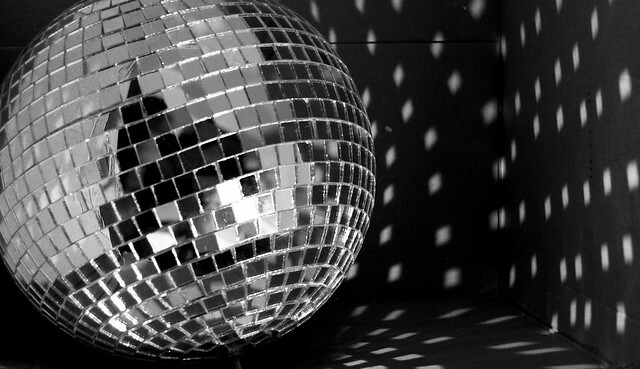 The tunes, pounding to make the mirrored ball wobble slightly in its rotation, are thirty years old. More significantly, there are no unscalable social walls. Everybody is glad to see everybody, and everyone is someone you want to hang out with. You never have to feel nauseous or out of breath around the unreachable boy or girl you’ve been crushing on since 8th grade. Some of us might admit to cherishing the secret aching thrill of that nineteen-eighty-something unrequited crush–but really, tonight, we’re glad we’re past all that. I’m pogoing around with one of the coolest women I know (she’s into Flashdance, I can tell, but she’s got black Chuck Taylors, too), screaming the lyrics to a Prince song. Then a Clash song. Then Frankie Goes to Hollywood. (I’m one of those sorry dancers who can’t get excited about a song I can’t sing.) Our guys are, predictably, “taking a break” with a beer, but tonight that’s totally legal and public. A couple of us sneak out the back door for a smoke, but we’re only sneaking away from general disapproval, not from an irate chaperone with an itchy detention finger. Truth–we are all far too old for this, and having too much fun to care. This would be such a boring movie. Middle age’s yearning, regret, dread and fear are fodder for some great dramas of recent years: Breaking Bad, The Fighter, The Shawshank Redemption. On the lighter side, there’s The Silver Linings Playbook, in which a middle-aged man’s marital and career failures, his emotional instability, and his latent neurochemical disorder combine to throw him into a mayhem that only true love can fix. Lucky for him, true love is just around the corner, because his story happens in Hollywood, not in real-life American suburbia. Of course, Hollywood stories conjure up disasters for every age group, but stories about middle-aged Americans offer a near-perfect parallel between bittersweet or outright sad stories and life’s emotional truths. According to The Economist, researchers in the 1990s identified a reverse trend to the historic wisdom that contentedness increases into middle age. Depression and general unhappiness now appears to peak around age 46. The bliss-out of the odd ’80s Parent Prom is completely out of character for people my age. Middle age is a time to discover that marriage was a regrettable mistake, or that staying single was miserably short-sighted. It’s a time to yearn for grandchildren and dread cancer. Or to regret childlessness and lost love while dreading cancer. Or to fear you’ll never be ready for grandchildren (assuming you survive for that long), because your teenagers will never become independent enough to leave the house. And all of it, from the relationship and reproductive failings to the cancer, is our fault. The good–and perhaps more surprising–news is that happiness takes an upswing after 46, peaking at age 69. (69, dudes–wait, is that a researcher’s idea of a media prank?) Older people generally have achieved a certain sense of accomplishment. They have learned to take pleasure in little things and to be more accepting, instead of being anxious and judgmental. Did I say we’re too old for dancing all night and enjoying the moment for its fleeting pleasures? Maybe I should say that we’re too young. We’re a joyous knot of people who don’t appear to remember we’re supposed to be battling depression, neuroses, and health issues of every kind. For a few hours, we’re surprisingly happy. We feel beautiful and strong. A man who manages to look completely out of place (he’s dressed as Bill Nye the Science Guy, far as I can tell) is doing splits and handstands. A woman who was clearly very, very hot in her teens finds her old breakdance moves, igniting the floor again. My friend and I are still bouncing around in our Chuck Taylors, belting out tune after tune. We’re ridiculous, in other words, more like the cast of Mamma Mia than a John Hughes revival. Something about constructing a 1980’s time warp and cutting loose among friends has suspended our ability to worry about tomorrow, or about our waistlines, or about our lower backs and knees and metabolism. Tonight, we just want to dance. Tomorrow I’ll be too hoarse to sing, too sore to roll sideways in bed. Tomorrow I’ll be 45, or well on my way to peak middle-age unhappiness. Do I really have to go back to being middle-aged tomorrow? I can’t wait to be 69. Photo by jonstead., via Flickr. Only now am I sorry that I had to miss the Parent Prom!